It can be tempting to treat baby teeth like Kleenex. They're disposable, so why should you take care of them? 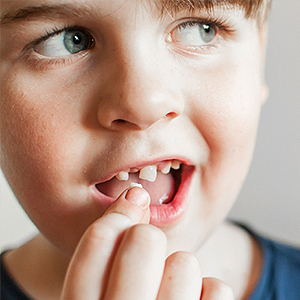 These little choppers, also known as primary teeth, are more important than you may think. For one thing, they reserve space for the permanent “adult teeth,” helping to guide them into position. When baby teeth are lost early, due to decay or injury, permanent teeth can drift into that extra space where they don’t belong. It's like when it snows and you clear out your parking spot and save your spot by putting a lawn chair there. Without that chair, you just might find your neighbor's Buick in your spot! Adult teeth are sneaky like that and can move into space if there's no baby tooth holding the spot. Decayed or damaged baby teeth can also result in crooked and overcrowded permanent teeth. They are important in the development of speech, and forming the proper facial shape as well. When a baby tooth gets decayed or infected, it can damage the permanent tooth developing underneath. Be sure your child avoids too many sugary drinks and sticky foods, and help them to brush frequently. Remember – it’s not just sodas and sports drinks. Even healthy drinks such as juice and milk are full of sugar. Of course seeing the dentist for regular check-ups and cleanings is important for decay prevention. Dr. Jeff suggests that babies come in to the office as soon as the first teeth erupt. Even if it’s just for a ride in the dental chair and a quick brushing, getting your child accustomed to the dentist goes a long way! So now you know why it's important to take care of those baby teeth! It's also a good idea to encourage kids to learn how to take care of their teeth early on, and hopefully those good habits will carry on into adulthood.